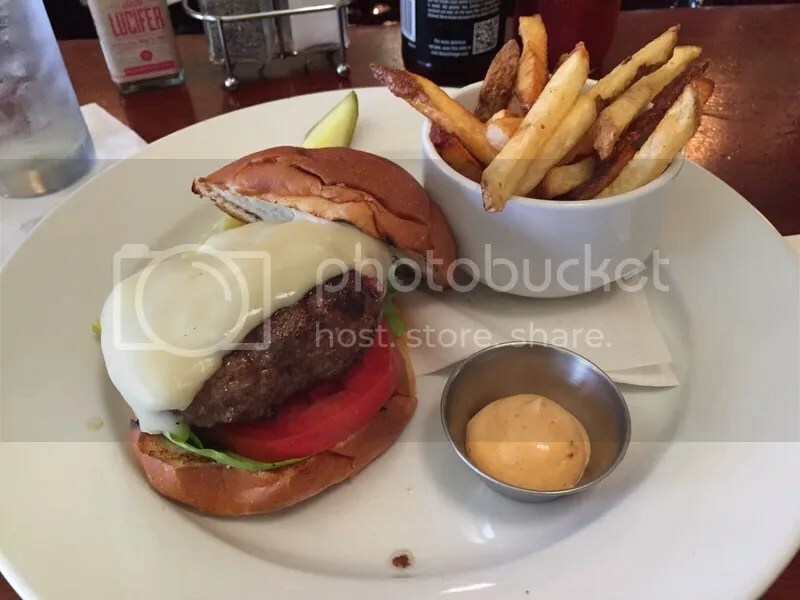 I’d been meaning to get over to Sassafras in Old City for a while now to check out their Tuesday “Luncheon Lunacy” special: Between Noon and 5 PM, their signature sirloin burger is only $5.95! Unfortunately, I work on the opposite side of the city and Tuesdays can get pretty hectic, so I hadn’t been able to pop out and make the trip until this week. 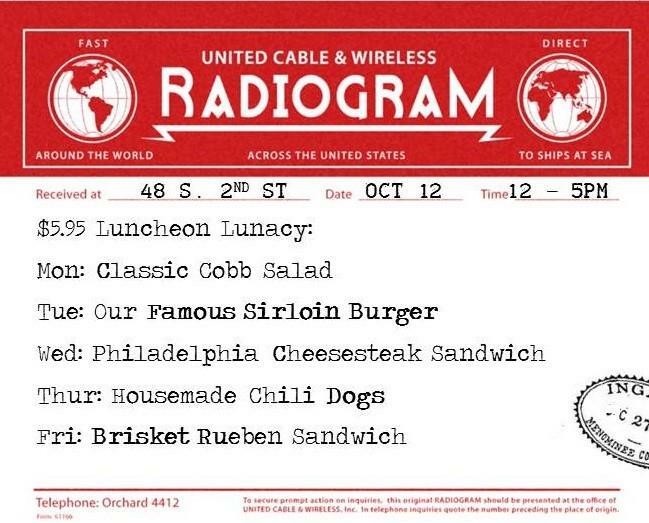 The burger comes with your standard LTO (lettuce, tomato & onion) and your choice of fries or a salad. You can also add cheese for $1 more, so I went with sharp cheddar. The burger came out cooked perfectly medium as requested, with lots of juicy blood drippings (mmm, morbidly delicious!). The patty was quite thick and just slightly smaller in circumference than the bun. I was able to navigate and keep the burger-to-bun ratio balanced though with each bite. The cheddar cheese was oozing and gooey and kept falling off the patty, so I just kept picking it up with my fork and adding it back on. I also smeared a little of the garlic aioli on the top of the bun to give it a little extra flavor. All in all, it was the perfect bar burger. No frills, no muss and all at an unbeatable price! They also have other burger patty options on their menu (which are not included in the lunch special) like lamb, bison and ostrich, which sounds totally wild! Factor in their amazing classic cocktail list and live jazz during the week, and I’ll definitely have to make a return trip. Posted in aioli, bar burger, buns, burger, burgers, lettuce, LTO, lunch special, meal deal, Old City, onion, Sassafras Bar, sirloin, tomato. Bookmark the permalink. Despite Pennsylvania’s archaic liquor laws (which up until recently required you to buy an entire case of beer from a distributor or buy individual bottles and 6 packs at a significant markup from a completely different store or a bar), there are breweries abound all over of the state – many of them right here within the Philadelphia area. The demand for great beer is so high here that we even have our own annual event celebrating it – Philly Beer Week – which kicks off one month from now. And what goes better with beer than a great burger? 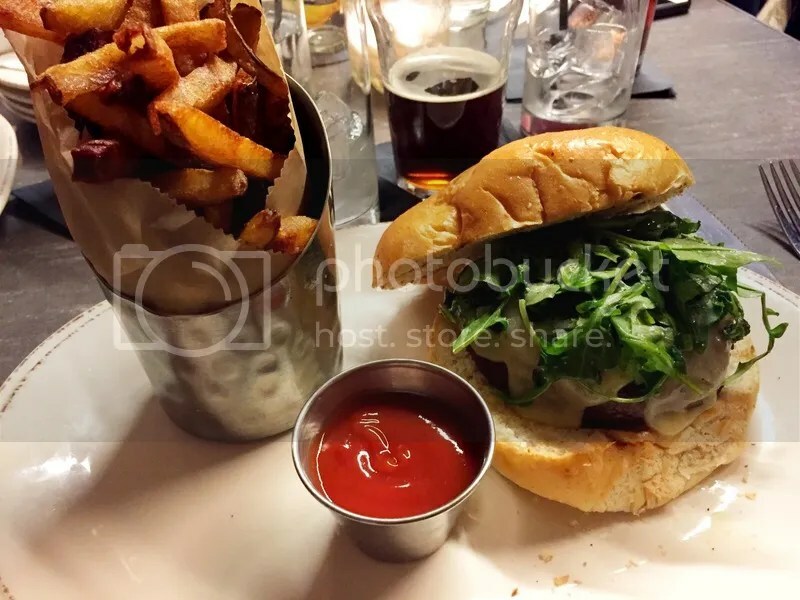 This week I stopped into 2nd Story Brewing in Old City (which recently opened in the old Triumph Brewing space) to check out their namesake burger, which comes topped with arugula, cheddar and tomato jam on a Le Bus bun. The burger was cooked perfectly to medium as requested and was nice and juicy, but not so much so that it would sog up the bottom bun. The bitterness of the arugula was countered by the sweetness of the tomato jam, which was smeared on the bottom bun. It kind of snuck up on me at the end – in a good way! A nice treat for the last few bites. As for their beers, I tried the Five Mile Ale, a dark, English mild-style beer that had notes of chocolate and toffee, but was light enough to not leave me feeling full the way a porter or stout might. They’ve also got another burger on the menu topped with battered/fried onion & jalapeno, Fritzie’s fondue, and a Tilted Barn farm-fresh egg. I can’t wait to get back to check it out along with a few more brews! Posted in 2nd Story Brewing, arugula, beer, brioche, buns, burger, burgers, cheddar, Le Bus, Old City, philly beer week, tomato jam. Bookmark the permalink.